Crown counsel has charged Xin (Ivy) Zhou, the operator of a Surrey breeding and boarding facility, with animal cruelty under the Prevention of Cruelty to Animals Act following a BC SPCA investigation. On Feb. 16, 2016, BC SPCA constables seized 82 animals in distress – 67 cats, 12 dogs and three puppies – from Zhou’s property. Zhou has been the focus of previous SPCA investigations. The cats taken into BC SPCA custody were primarily Persians and short-haired exotics. The seized dogs included four French bulldogs, a Boston terrier, a Pomeranian with three puppies, a Chihuahua, a poodle, a Rottweiler, a Doberman, a Jack Russell terrier and a shiba inu. “In this most recent case, we executed a warrant because we received information that Zhou was failing to provide adequate care for the animals who were currently in her custody,” said Marcie Moriarty, chief prevention and enforcement officer for the BC SPCA. Most of the animals, who required months of treatment in SPCA care, have since been adopted into loving homes, while some had to be euthanized because of critical distress. The maximum sentence for Zhou if convicted is a $75,000 fine, two years in jail and up to a lifetime ban on owning animals. The BC SPCA investigates nearly 10,000 complaints of animal cruelty across B.C. each year and is funded primarily by community donations. 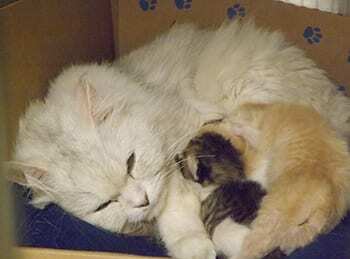 Photo: A cat and kittens who were seized from Zhou’s property on Feb. 16.